SKU: RF6300-1. Categories: Fixed Bail Snap Shackles, Snap Shackles. All stainless steel snap shackle for high load and excellent corrosion resistance. 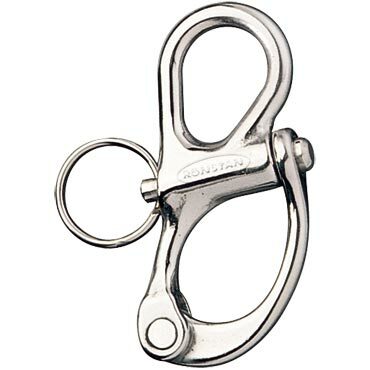 Ronstan Industrial Snap Shackles are manufactured using investment cast 15-5 PH stainless steel body and hasp and Grade 316 plunger for a high strength-to-weight ratio. The choice of investment casing the components for all Ronstan Snap Shackles created a light shackle with exceptional strength and durability. All components of the shackle are stainless steel event he spring which allows for use under the harshest of conditions. There are two basic categories of snap shackle, fixed bail and swivel bail. The bail is the non opening loop on the snap shackle. The trunnion refer to the opening hook of the snap shackle, some have fixed trunnions others have swiveling. The RF6200 is a medium fixed bail stainless steel snap shackle with a breaking load of 4,840 lbs. and weighs in at 3.5 oz. This item is available in a polished finish or black oxide. B. L. : 4,840 lbs.